On the 19th July, 2017, Sega announced the cancellation of Archie's long-running Sonic the Hedgehog comic. The series began all the way back in July 1993. Relevant to our interest here, however, are the two Mega Man crossover spin-offs; Worlds Collide and Worlds Unite, particular the latter. Relevant because in these spin-offs, certain Street Fighter characters also appear! 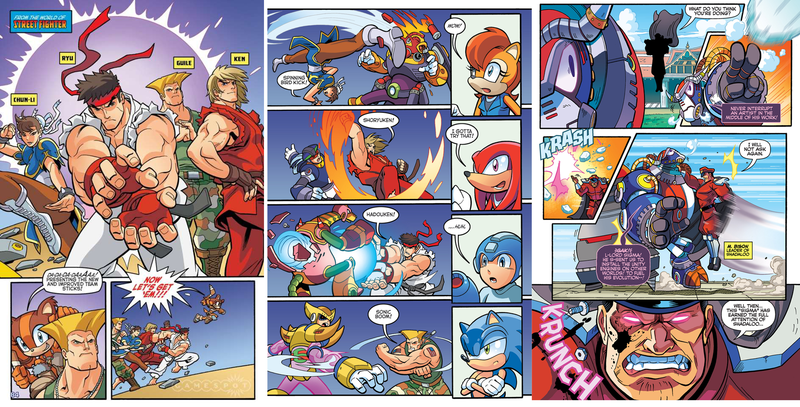 Alongside other Capcom characters, Ryu, Ken, Chun-Li, Guile and M. Bison all make appearances in Worlds Unite. I find Archie's inclusion of the characters interesting from the presumption that Udon owned the comic book rights to Street Fighter at this time. Clearly they worked something out. Censored! A very subtle change was made to Ken's stage in international versions of World Warrior when it was ported across to Super Nintendo. On the Japanese Super Famicom version, the man in the background wearing the blue trenchcoat appears to be making a lewd gesture with his hands in front of his midriff. It's hard to believe this wasn't intentional given that he doesn't do it in the arcade original—it certainly looks peculiar! The position of the man's arms was changed for the American/European versions of the port, presumably to avoid any bother from the PTC and suchlike. Incidentally, when Turbo was released this background character was redrawn and recoloured and hence 'fixed' on Super Famicom thereafter. Thanks to Cinemassacre for unearthing this one, I'd never come across it before. Love your videos Nerd. 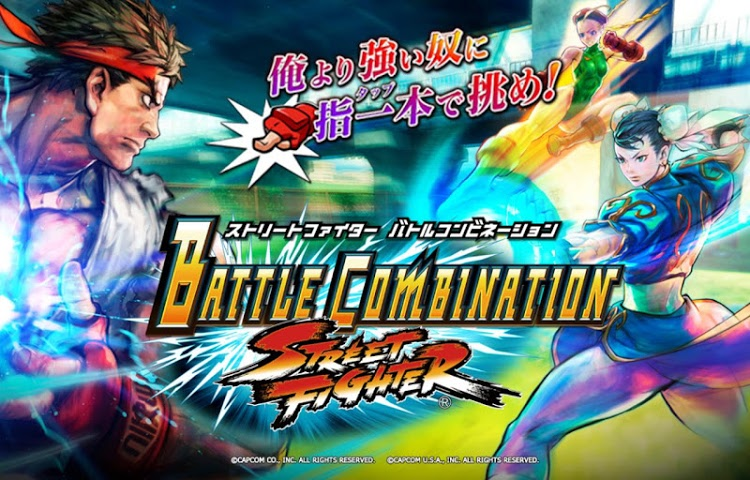 If you've not heard of Street Fighter Battle Combination (2015), don't worry - you're not alone. This is a turn-based card game based on the Street Fighter IV engine, allowing match-ups up to 3 vs 3 players. Crucially, to date, this title has only been released for Android and iOS devices in the Asian market, so details in English are fairly sketchy. To quote from one source, 'The main selling point of the game is to take away complex button mashing and allow players to unleash powerful combos by just tapping the mobile screen.' One cool feature, from what I can gather, allows players to pit legacy versions of characters against their latest iteration; e.g. Street Fighter III Ryu versus Street Fighter IV Chun-Li. Just a pity it's not available internationally, especially as some of the artwork used in this game is really stunning. Iwashigahama Japan Women's Pro-Wrestling is the fictional wrestling federation that Rainbow Mika and (former) tag partner Yamato Nadeshiko belong to, expanded upon in Street Fighter V. Out of curiousity, I stuck 'iwashigahama' into a popular online translation tool and it revealed that the name, in English, is, 'Sardines are on the Beach'. This made me smile, and it also explains the image of a fish on the company's logo (which is a parody of New Japan Pro-Wrestling's logo in real life). Other known members of IJWPW are: Harmageddon Yoko, Sunrise Nishisenba, Maple Storm, Vivian Nishiki, Pepe Ishiwata and the tag-team Furai Shimai, comprising sisters Raika and Fuka. 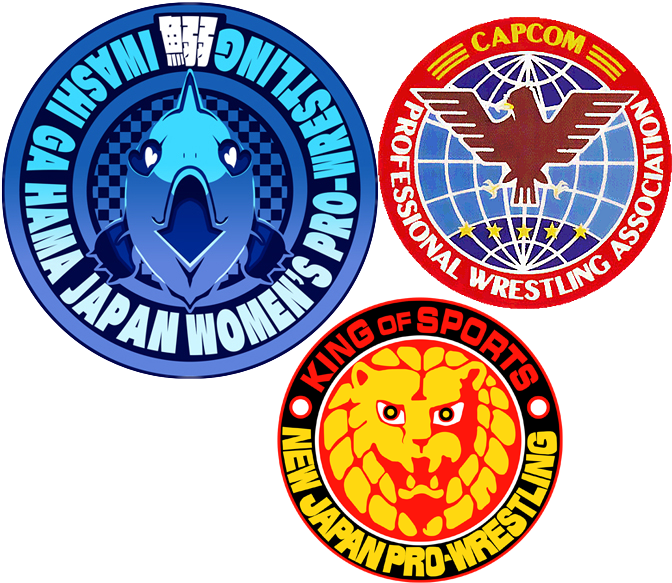 The IJWPW is the second fictional wrestling federation in the Street Fighter/Final Fight/Slam Masters universe, following the CWA (Capcom Wrestling Association). 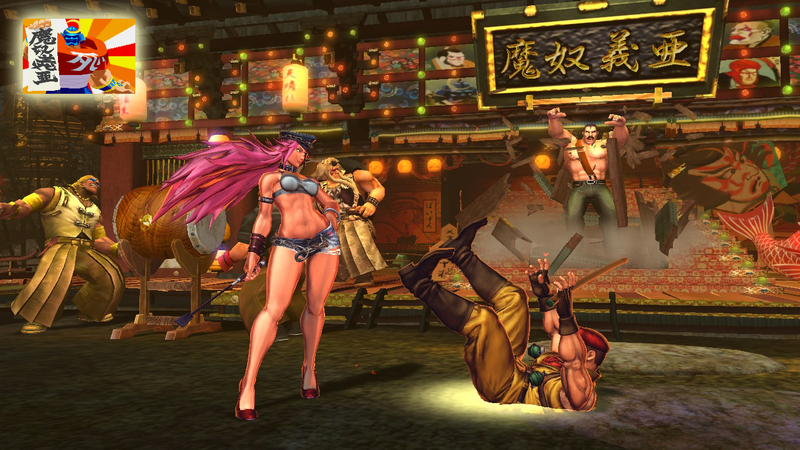 The Mad Gear Hideout is an arena featured in both Street Fighter × Tekken and Ultra Street Fighter IV. The stage is notable for a number of Final Fight character cameos taking part in a Kabuki show. To summarise the action, (and a thank you streetfighter.wikia for this!) in the first round, Abigail appears from a platform in the central stairs. In the second round, Sodom joins the show, also appearing from the centre. At the end of the second round, Mike Haggar breaks through the centre, scaring the Mad Gear members. In the third round the lights are turned off and Haggar can be seen chasing Sodom. Axl and Damnd are knocked out, and the other gang members are visibly tired. At the end of the battle, Abigail and Andore collapse and the sign above the hideout (which says 'Mado Gia', as per Sodom's Warriors' Dreams ending) falls. Ultra IV confirmed that the stage is located on the U.S. East coast, presumably Metro City. 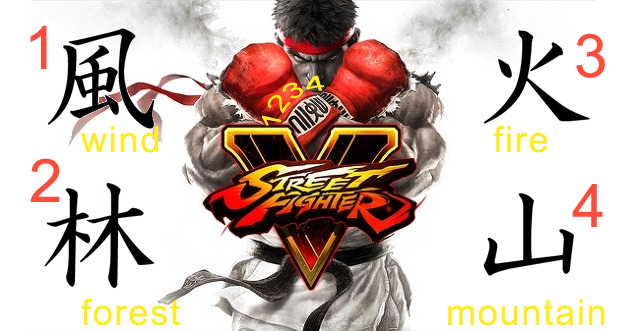 Have you ever wondered what it says on Ryu's Street Fighter IV & Street Fighter V era gloves? (These gloves look awful by the way; they look like the 8oz boxing gloves that came free with the punching bag I've got in my garage.) Well, it's a highly stylized version of the Fūrinkazan with the four characters representing Wind, Forest, Fire, Mountain respectively. If you've got a sense of déjà vu, then that's because I've written about this before (Vol I, page two): the same kanji (much less stylized) have appeared on his belt (in some official artwork) and on the breakable flags in his World Warrior stage. To repeat, the phrase is an abbreviation of a famous aphorism in Sun Tzu's Art of War. Remember those early Street Fighter II character drafts we saw earlier? Humorously, the one wearing the Zubaz wrestling gear would rise again as the inspiration behind Divekick character The Baz, released in 2013. For the sake of brevity, Divekick is best described as fighting game parody containing many references and in-jokes to other fighting games and their mechanics. Indeed, 'dive kick' is itself a stock phrase for a type of (often abusable) attack common in Street Fighter and other fighting game series. The rebirth of the Baz continues with the character making appearances in, for example, Shovel Knight (2014) and Indivisible (2018) as a hidden boss in both. 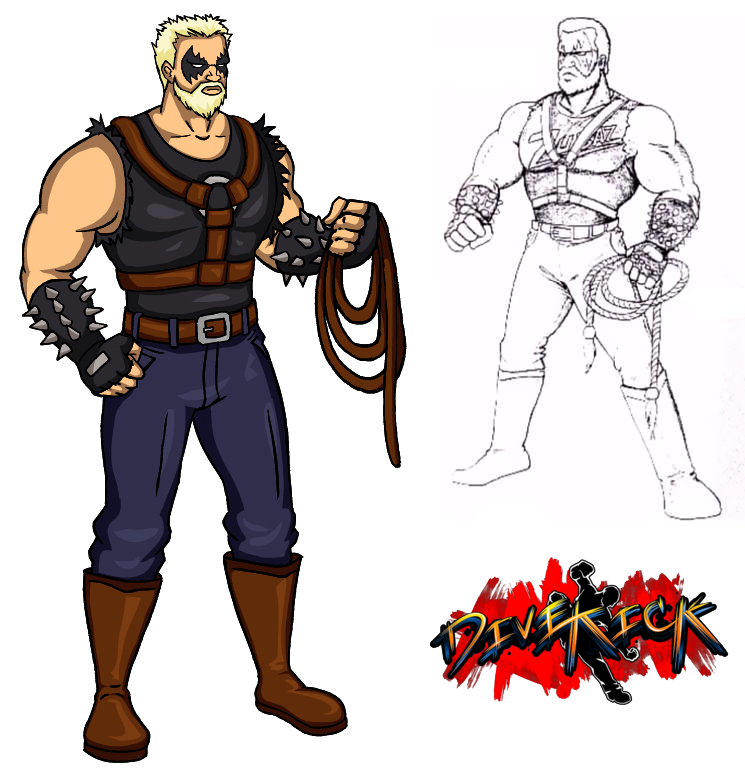 The character was described by Adam Heart (creator of Divekick) as having, 'Been rejected from almost every fighting league on the planet, usually because he looks too lame or his fighting style doesn�t fit in', a knowing reference to his omission from World Warrior! 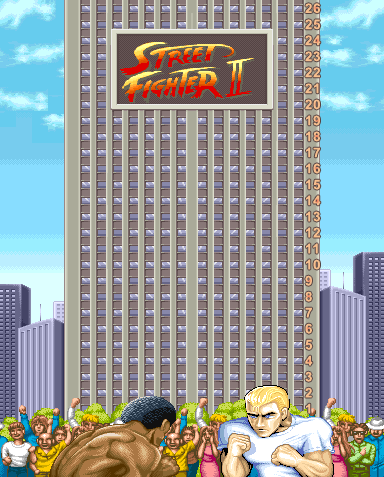 The tower shown in the attract screen of World Warrior, Champion Edition and Hyper Fighting has 26 visible floors. 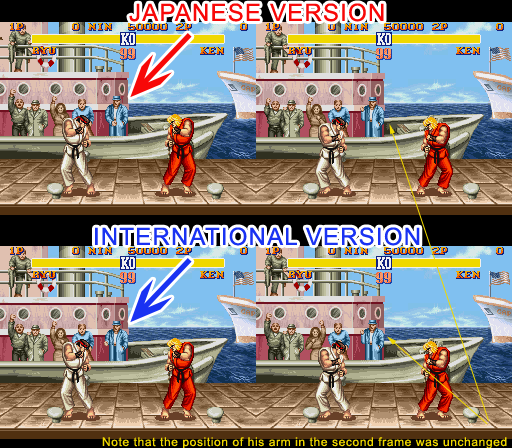 This is true of the arcade versions but the details vary from port to port. It's impossible to say how tall the skyscraper actually is though as we never see the top of it! But, there's probably another floor and a lobby obscured by the trees and crowd in the foreground so it's safe to say that it has at least 28 storeys. "you can't escape my gale! ...or something like that."